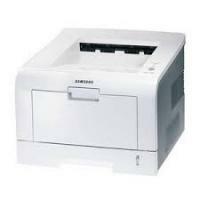 The Samsung ML-2251N is a mono laser printer. It falls easily in the budget. It is a networked printer, therefore this printer is apt for offices and workplaces where printing is often required. The Samsung ML-2251N is shipped with a Samsung ML-2251N Toner Cartridge. This is an installer cartridge and should be installed as the first cartridge. The Samsung ML-2251N printer is 14.1 inches in width, 17.8 inches in length and 10.9 in height. It weighs 10.6 kgs. The printer comes is a matt white color. This smart looking printer can be placed in any workplace setting. The Samsung ML-2251N network printer gives good print quality. It can print up to 30,000 pages per month. The black and white print resolution is 1200 X 1200 dpi. This, along with the Samsung ML-2251N Toner Cartridge aids in the appropriate print quality. This printer can be connected to various users at a time and complete print jobs given by different sources efficiently. The paper tray can hold up to 250 pages. The Samsung ML-2251N printer is compatible with Windows 98,2000, ME and XP and Linux: Caldera, Debian, Red Hat, Slackware, Mandrake, TurboLinux and SuSE. A print speed of 22 pages per minute has been recorded. It has USB 2.0 High Speed. The drivers for the printer can be easily downloaded form the internet. The Samsung ML-2251N printer lacks some important features such as WiFi or Bluetooth connectivity. Pictbridge is absent and the printer does not have the function of auto duplexing. But this budget printer offers great print quality and the print speed is also good. The printer works great for startups and offices that are looking for budget printing. How to enable Toner saver mode? The life of your Samsung ML-2251N toner cartridges can be increased by using toner saver mode. This will not only help you to reduce the cost per page but will also reduce the print quality. To turn on the toner saver mode using control panel press the control button on the control panel for 0.5 second. The printer must be in ready mode (on line / error LED is on). If the toner save LED is on, the mode is enabled and the printer uses less toner to print a page. Precautions: While handling the cartridges do not expose them to light once opened. If required cover them with a paper. Also, do not use any sharp equipment to remove the packing as it might damage the drum of the cartridge. Q. Can using compatible Samsung ML-2251N toner cartridges instead of the original toner cartridges invalidate my printer’s warranty? A. No, your printer’s warranty will not become void if you use compatible toner cartridges with the printer but, the warranty does not cover any damage caused due to compatible cartridges. However, you do not need to worry about that since our compatible toner cartridges are of high quality that have been FSC tested and certified to match quality standards. Q. How do I avoid paper jams for my printer? Making sure that the paper tray is not overloaded. Do not exceed the paper limit mark on the inside wall of the tray. Not hampering with the paper from the tray while your printer is performing a print job. Flexing, fanning and straightening the paper before loading it in the printer. Using only the recommended paper type with your printer. Q. I have spare toner cartridges from my old Samsung ML-2250 which is no longer in running condition. I was wondering if I could use these spare toner cartridges with the Samsung ML-2251N as well? A. Samsung ML-2251N toner cartridges are the same as those used in Samsung ML-2250 printers. You can use the old cartridges with an ML-2251N printer without any hassle. Just make sure that the spare cartridges have not dried out. Q. Do you also provide paper that can be used to print on with Samsung ML-2251N printers? A. Yes we provide a range of papers to be used with your printer. You can find the whole list of paper supplied by us here. Q. Are the prices of the Samsung ML-2251N toner cartridges inclusive of delivery? How long would it take for the product to be delivered to me? Q. Hello. I am really confused with the decision of purchasing a Samsung ML-2251N. I need a printer for my home-office and I would be using it just to print black and white documents. I want to know that should I go with this Samsung ML-2251N monochrome laser printer or should I opt for a monochrome inkjet printer? Which one will provide me crisp and clear documents along with some savings on the consumables? Please suggest. Thanks. A. Sure. First of all, we would like to inform you that your decision of buying the Samsung ML-2251N is absolutely perfect. Monochrome laser printers like Samsung ML-2251N give out crisp and quality documents. The laser-based mechanism of the machine burns the toner onto a sheet without diffusing or requiring a drying time. So as a matter of fact, you will rarely encounter problems like garbled texts with laser printers which is likely to be caused with an inkjet due to the liquid inks used. When talking about the Samsung ML-2251N toner cartridges, they are slightly more expensive than ink cartridges. However, they last much longer and provide high-quality documents at the fraction of the cost of ink cartridge. Overall, laser printer will give you better black and white documents at cheaper cost per page. Inkjet cartridges on the other hand are best when required for printing colour photos or documents. Hope this clarifies your confusion. Q. It is mentioned on your website that the remanufactured Samsung ML-2251N (ML 2250D5) toner cartridge offers 5750 pages. As my printing requirement is limited will it last for a longer duration, say about 2 years? A. Yes. The Samsung Ml-2251N toner cartridge can last for as long as two years or even more. In fact, some of the users have reported to using a single toner cartridge for more the 4 years. So, you can use it without any worries.